The idea for Clemenceau's Daughters was born when I was thumbing through my great-great-grandmother's photo album and found a girl who looked uncannily like my daughter staring back at me. What if personality traits pass through the generations as readily as physical appearance? What if those traits were evil? With that idea, the seed for the novel was planted! Clemenceau's Daughters by Rocky Porch Moore is an eerie, Southern Gothic novel that details the blood-soaked legacy behind cracks of innocence. The book is separated into three parts. The first part introduces Debbie, a young girl with a strange ability that has led to the death of both her babysitter and her beloved grandfather. The second part reveals the frightening history of why that ability attracts so much tragedy, and demonstrates just what happens when hatred goes unchecked. The third part finally describes the results of such a past, with Debbie losing yet another loved one. I loved the parallels Moore has drawn between the mothers in the book. Both Maisie and Carolyn did whatever they could to secure their daughter's happiness; Maisie in ensuring Clemenceau's fortune and reputation, Carolyn in keeping Debbie safe. But despite their efforts, that bittersweet ending still tied their stories together. 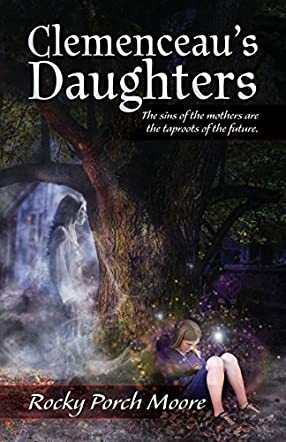 From one secret to another, the determination of the mothers to try to secure their daughter's future was a consistent idea in the book, which made the prologue all the more terrifying. I also enjoyed the symbolism. The ominous mountain, the foreboding deaths, and even the tree at the beginning of the book; with each different symbol comes yet another warning about the dangers lurking nearby. Even the colors and details were haunting; the pink walls and wide-eyed dolls in Debbie's room, supposedly every girl's dream room, something she can relish in the follies of her youth. But even so, the horrors of that legacy still tore that room down and shoved her into the open, with a large target painted on her back. The Southern Gothic feel forced me into a dreamlike daze, as Moore lulled me into a false sense of security through the eyes of a child. Coupled with the shattered innocence that hid the sinister shadows beneath, Moore showed the age-old lesson of what happens when hatred goes unchecked. I would thus recommend this book to readers who loved The Magnolia League series and Beautiful Creatures.